Do you remember that breathtakingly gorgeous tulle skirt that I wore and featured in my very first OOTD post, Mostly Monochrome? Well, this post is all about the talented designer that created it. 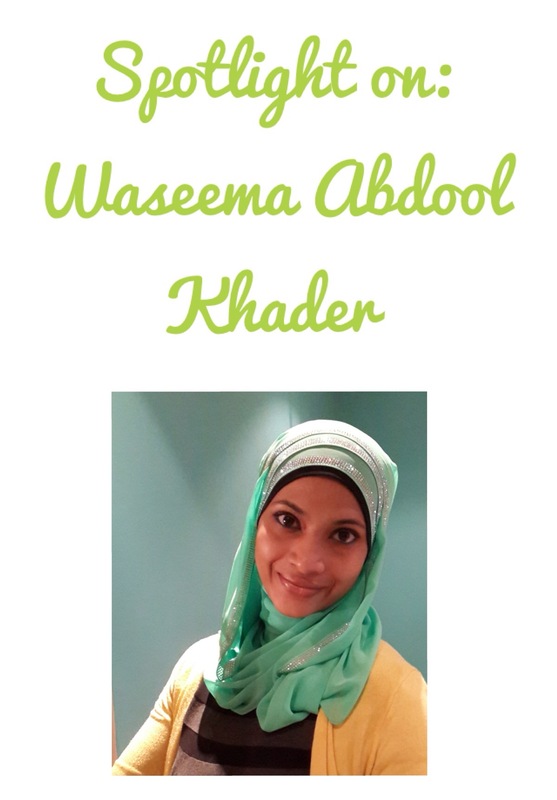 Meet Waseema Abdool Khader, creator and designer behind Iridescence Fashion Design and Couture, qualified in Advanced Design and Construction from the Uberglam Fashion Design Institute in 2011, and has been creating masterpieces ever since. I ‘met’ Waseema during the course of the year and we immediately became friends. I say ‘met’ because we haven’t had the opportunity to meet in person just yet, we just email/FB/Instagram like everyone else out there. Waseema is honestly one of the kindest and humblest souls that I have ever had the pleasure of knowing and you can immediately tell, when speaking to her, that her heart is in the right place. She is always inspiring me and providing me with words of encouragement, and I’m glad to have her as my friend. And having her as my friend means I get to interview/interrogate her for blog purposes too – win, win! R: What was the inspiration behind the name of your design house, Iridescence Fashion Design and Couture? W: I love colour and iridescence is also a quality of natural elements from rainbows, diamonds, to marine life, butterflies and spiderwebs glistening in the sun, it is also indicative of change and processes that result in this quality and this is exactly what I wanted to be representative of my design house. On a side note, I intend to consistently and constantly improve and advance in my skills as a designer, incorporating new developments in the design industry, and devloping my own processes and ideas. And in addition to that, providing a service which is friendly, committed to quality and client-driven with close attention to detail and high fashion trends. R: What do you enjoy most about what you do? W: I love the flexibility and it such a dynamic career. I get to meet new people from very different backgrounds, which is a great blessing as it brings new friends, design challenges, helps me to grow and develop new techniques. Most of all, I love having the ability to create beautiful garments from a simple thought, dream or sketch and making that into a reality. And of course, I love the client feedback coupled with the priceless look on my client’s face when they first lay eyes upon their outfits – it is one of the best feelings in the world . It such an honour for me to have others wear what I have made! R: Where does the inspiration for your designs come from? W: My inspiration comes from anything and everything that surrounds me. Sometimes, it is just a random thought or a dream and other times it is inspired by the fluctuating trends, street style, nature and architecture. My experiences and the experiences of those around me also have the ability to inspire a design and sometimes, a design is simply inspired by something that I’ve been eager to create. R: How did you get into the Fashion Design industry? Was it always a dream of yours or did it just happen? W: I’m always asked this question and honestly I didn’t just get into it. Ever since I can remember, I have always been interested and curious about everything design related and very much into artwork and creativity. You know the saying, your heart is where your mind wanders to, well I always wondered how I would create the items that myself and others wore and found myself being curious about how things go together and the different design elements. After I completed my BComm Acc degree and Makeup Artistry diploma, I decided that fashion design will be the next step for me. I witnessed a lot of local designers struggle financially, so I figured that having a business degree was more imperative than a design one. Most don’t realize this but, fashion designing can be very time consuming, cut-throat, pressurizing and even financially demanding at times. Luckily for me, my BComm degree definitely gave me the strength and willpower to move forward in this industry. It was really difficult giving up all of the benefits that accompanied a position in the corporate world but the excitement and thrill of designing was much more enticing than being stuck in an office job! In a way, designing is more lenient as it allows me to be a great stay at home mum and wife along with a thriving and highly rewarding career. R: Is fashion design difficult and time consuming? If so, how do you manage your time between being a mom, wife and designer? W:It depends on how far you want to go. If you stick to creating items you know well and are used to making, it will be pretty easy and gets easier with practice. If however, you choose to venture out into new designs and ideas, the level of difficulty varies greatly. But I guess you could look at it in the way that if it’s more challenging then it’s more rewarding. You know, it is difficult multi-tasking between being a mum, wife and a professional designer. But thankfully, I have an uber supportive husband and my kids are little so they take naps often. So you would usually find me working when they nap or at night for atleat 3 hours at a time, which is more than enough time to get what I need done. I love my family so much and I love being a mum and a wife so I take it very seriously. Sometimes, I do drop the ball on both counts but I always remind myself that the game isn’t over yet and that I need to turn my setback into a comeback. R: Where do you see your business in the next 5-10 years? Perhaps, an online store? Or are you content with where everything stands right now? W: I have huge plans BUT I cannot give them away just yet! I will say though, that I am very happy with where I am right now because I have made huge leaps to be here. I love change and I believe that life is too short to stay in your comfort zone, so I will continue to push forward, take on new challenges or even invent them if need be and make leaps Insha’Allah! Regarding online, I currently do have a strong presence online and I intend to make it that much stronger in the future. It has been an unbelievable journey and I am very excited about the future of my design career, business and just the design industry itself which is constantly evolving. She’s brilliant right? Yup, I think so too! If you want the ever so talented Waseema to design and create a garment for you, be it for an occasion or just something casual, you can find her on Facebook under the name Waseema Abdool Khader. She is also a fashion, lifestyle and hijab blogger and you can find her blog here.